Have you ever wanted to get your hands on a boards script that is easy to use, highly customizable and comes packed with features you love in matrix scripts? Well, this is it! We're officially introducing our very first 'Ultimate Boards Scripts' that includes everything the matrix scripts have to offer, and the convenience of boards as well. If you didn't know, a great feature of Ultimate Boards Script is that you have the ability to climb on top of other members when your referrals join the program. As soon as you complete your Board, the board gets split into multiple boards. This process continues ‒ giving you the freedom to earn a hefty passive income. 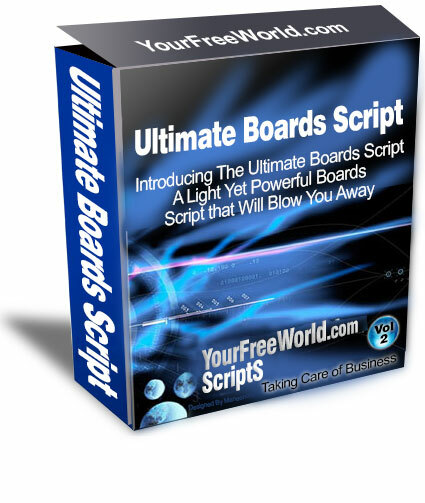 The best part is: as soon as you get your hands on the Ultimate Boards Script, you are immediately welcomed with a marketing bonus and a download package that can help your affiliates in kick-starting the promotion of your product or services quicker than ever. It's also very easy to setup the whole thing. All it takes is just a few minutes of your time to set one-time joining fee, commission payouts for each level and you're all set! And don't forget that, like all other matrix scripts, you also have an added value of banner views and text ads that can help generate a massive in-house advertising revenue for you and your members. Of course, you have the full flexibility to customize your boards the way you want it. This is one of many reasons why you'd want to choose our Ultimate Boards Script over other scripts. So, what are you waiting for? 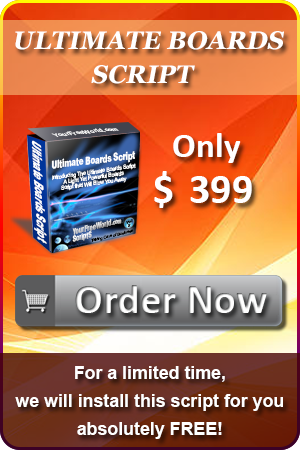 Get your hands on Ultimate Boards Script and start earning now! Set unlimited Boards from the admin area. Set the width & depth of the Board. Use a company forced Board or regular forced Board. Set to pay on complete Board or per member per level. Set to allow re-entry into next Board or not. Set to allow re-entry back into the same Board or not. Set the membership fee to join. Define your own m * n Forced Board up to 10 x 10 Levels Deep. Set Commissions for Referral Levels up to 10 Levels Deep. Set Matching Bonus Commissions for Sponsor on Direct Referrals Downlines up to 10 Level Deep. Set the special Referral Bonus for member affiliates for promoting & referring new members to your program. Ability to set the payout for each member that cycles through to complete the Board. Eg. $100. Allowing cycled members to be re-entered into the existing Board or new Board under a new position if you choose. SolidTrustpay,PerfectMoney and Bitcoin compatible and you can also add 5 more merchant accounts of your choice. SolidTrustpay,PerfectMoney and Bitcoin IPN for auto-approval of accounts. SolidTrustPay Masspay System to pay all the Members Earnings by SolidTrustPay at once. Edit Your Pages by placing the HTML code into the system for the FAQ, Home, Logout and Member's Area Home pages. Customise the welcome, account activation and other system emails. Add/Delete email ads and banners for members to promote your service. Banner Ads Addon: Offer x banner(s) to members to be rotated throughout your website. Text Ads Addon: Offer x text ad(s) to members to be rotated throughout your website.